Where did you pick up your boater? I love it. I do NOT believe it!!! 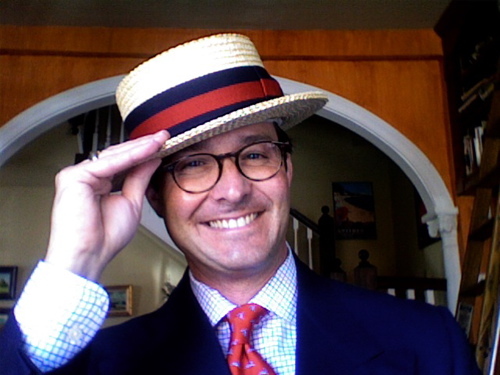 I was going to break out my Brooks Brothers boater which looks just the same and wear it today after a several year hiatus. I got a rather violent negative reaction from the Irish Redhead however and chickened out. NEXT YEAR my friend….NEXT YEAR….or I am coming to Richmond for Easter!!!! Boaters uber alles…. I am so glad to see that real hats for men are making a comeback. Something good actually came out of the baseball cap trend! The only problem is that most of us are too young to know what male hat etiquette is, and we’ve lost the charming reflex of tipping, lifting, or removing one’s hat as a sign of respect. There are too many men wearing hats in performances and restaurants. Because so few men now attend religious services, there isn’t an awareness that they should be removed in churches. It is terrible to see male tourists going through historic churches of Europe in baseball caps. I saw lots of them doing this at Notre Dame in Paris last year, and many other important churches in Europe. I hope that the hat wearing trend brings back some of the gallant, polite, and respectful rituals that once made human interaction pleasant. I hope that this “revival” is not too late to revive many of the centuries old skills of hat making, blocking, cleaning, steaming, etcetera. Happy Easter Chris to you and your family! Ps, I agree, it really bothers me to see people in church looking like they have been out cutting the lawn and gardening. I love a snazzy chapeau! I am aghast when I see people wearing jeans to church. There were always gloves and a hat when I was growing up. Not so much now, but certainly proper attire and well groomed! I wore my boater to a luncheon yesterday to great accolade, I was sorry we dined inside, I just wanted to wear more of it… A South African born and raised fellow attendee said at his prep back in SA they called them Bashers, another said Skimmers. Never the less, they are a marvelous hat. Hello Friar, I believe that I bought it at Hats in the Belfry in Georgetown (D.C.) a number of years ago. It is Italian, if you can imagine. You’ll be welcome around the drinks tray in the backyard, Mr. Lane. SwF, I only knew of one man who worked from his home in Bethesda, Maryland who still cleaned and blocked hats. And that was fifteen years ago. Mrs. E. teaches at a boy’s school and enforces the no hats at the table or inside rules daily. Mr. Ronfeld, I did have one fellow light up when he saw my “skimmer.” Young man, too. Bashers, huh? Debra, I do miss the gloves and hats at church days. Karena, thank you and I hope yours was wonderful. I’ve got one more to celebrate next week as it is Orthodox Easter! Lamb on the grill! “un beau chapeau” for a a beautiful day! You certainly know how to live up to your hat! As a college student, I worked at a completely gorgeous and fantastic bridal salon. The best part was coming in contact with an adorable and tiny woman who ran the Millinery department. She was a one-woman show, about 70 years old at the time, and she was not only the buyer of hats for this lovely women’s store, but she also MADE hats, repaired hats that had become misshapen, and she also designed and made bridal veils when a bride-to-be (and her mother, of course) could not find exactly what they were looking for to suit the gown. Next to raising my children, the best job I ever had. Most of the women who worked there were over 50–many in their 60’s. I learned so much from them! They had real wisdom, real taste, excellent judgment, and were not above serving the customer, unlike today’s typical sales help, who seem to resent waiting on anyone. P.S. A straw boater is hard to beat. Best wishes for a blessed Easter. Hello Paula, sounds like fun! I suspect that it is the lack of contact that we have with those older, more experienced men and women that results in our lack of refinement. Tastes evolve, wisdom and judgement develop over time. Hmmm… Hullo eA, Thanks. Hadn’t given it much thought. If I answer yes to the first, it might imply that I am old-fashioned and not open to change. Should I side with the second, it might imply that I am little more than a poseur. All articles of clothing carry this trap for me. I can tend toward costume if I’m not paying attention. But, if you’ve got a boater, Easter’s the day to wear it with no second thoughts. I do find that I dress to create a certain impression. When I worked at a PR company in D.C. (as an “assistant,” really, I had no qualms about being called a secretary.. company jargon) my boss, the Creative Director, would have me hail a cab since he noticed that they always stopped for me. I wore coats and ties. He was given a clothing allowance and fell in with Burberry. Cabs stopped for him regularly after that. In my experience, it is amazing the leeway one is granted if one is nicely dressed and polite. I think Jones himself would have been pleased as he followed up his above stated remark with “Hats are a passport to another world.” Borne out beautifully, I’d say, by your tale of your former employer’s success in the dicey art of catching cabs.